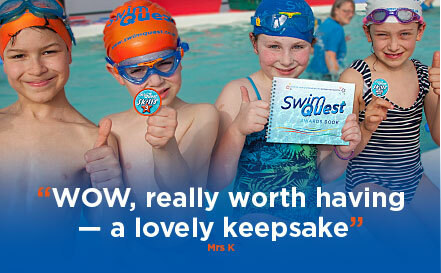 With your Awards Book you will chart your child’s Swim Quest adventure and collect Quest stickers as they progress. * A fun way to chart your child’s progress. 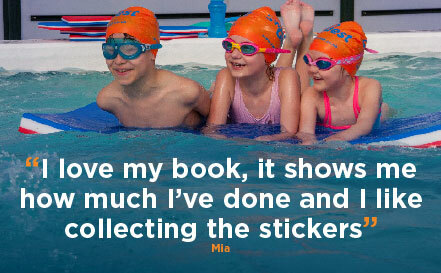 * Your child can personalise their book on the ‘About Me’ page. * Builds a clear record for each hat colour of their progress and achievements. * Collect stickers and create a unique keepsake. * Great value, one off purchase for the book – stickers are free when they are achieved. Send £12 via bank transfer (details are on your invoice) or send a cheque to: PO Box 468, Feltham TW13 9FA with your child’s name. "I think that the imagination and thought that has gone into its creation are fabulous. Its bright and colourful and works brilliantly for the child and their parent/carers. The sticker system is fab too as are the safety aspects which were lacking in the previous scheme. Its also beautifully and professionally presented too." "Its fabulous because I can draw myself and make the book my own." "Its great to see a record of my childs progress and what they need to do to get to the next level." "I love that all their swimming achievements are all together in one record book." "I love collecting my stickers." "My son loves his awards book and loves to show family and friends his achievements."